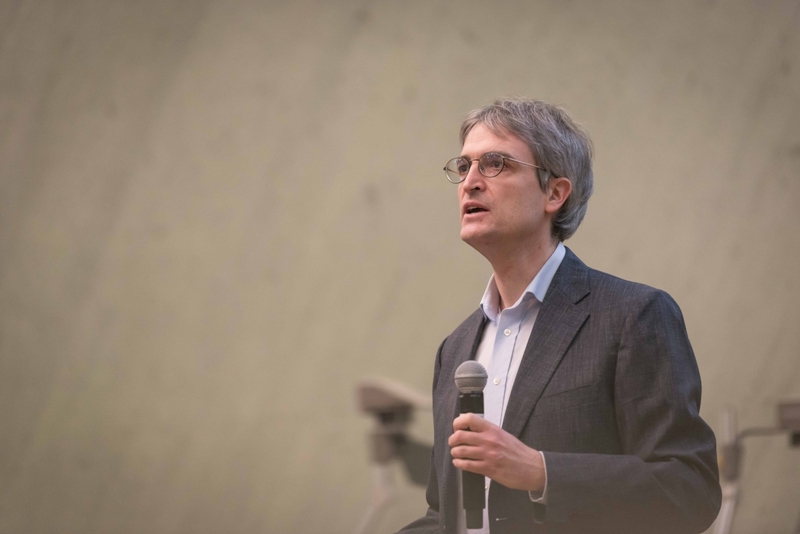 One of the 2018 Faculty Publication Awards was presented to apl.-Professor Wolf-Patrick Düll from the Institute of Analysis, Dynamics and Modeling at the 2019 Research Day of our university. “Publications are the central records of research and deserve proper recognition and appreciation.” With these words the Faculty Publication Awards of the University of Stuttgart were established in 2017. It was awarded for the second time this year at the annual Research Day. The Vice Rector Professor Monilola Olayioye dicribes this event as a platform to enhance research activities and interact with other researchers: “Our University is a place of top-level research, which is shown by the successful acquisition of two Excellence Clusters.” It is very important to make our research visible. Wolf-Patrick Düll received the Publication Award for his publication „Justification of the nonlinear Schrödinger Equation for a Quasilinear Klein-Gordon Equation“ in the Journal Communications in Mathematical Physics. We consider a nonlinear Klein-Gordon equation with a quasilinear quadratic term. The Nonlinear Schrödinger (NLS) equation can be derived as a formal approximation equation describing the evolution of the envelopes of slowly modulated spatially and temporarily oscillating wave packet-like solutions to the quasilinear Klein-Gordon equation. It is the purpose of this paper to present a method which allows one to prove error estimates in Sobolev norms between exact solutions of the quasilinear Klein-Gordon equation and the formal approximation obtained via the NLS equation. The paper contains the first validity proof of the NLS approximation of a nonlinear hyperbolic equation with a quasilinear quadratic term by error estimates in Sobolev spaces. The method developed in the present paper allows an answer to the relevant question of the validity of the NLS approximation also for other quasilinear hyperbolic systems.